Proprietary Name: Heb Extra Strength Antacid Assorted Fruit Flavors What is the Proprietary Name? Non-Proprietary Name: Antacid Tablets What is the Non-Proprietary Name? 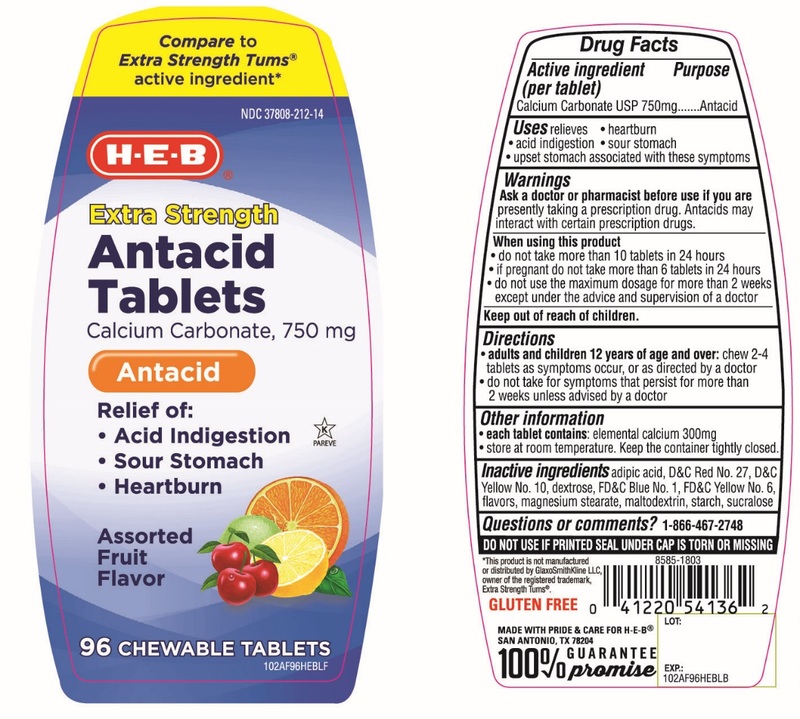 Heb Extra Strength Antacid Assorted Fruit Flavors with NDC 37808-212 is a a human over the counter drug product labeled by H-e-b. The generic name of Heb Extra Strength Antacid Assorted Fruit Flavors is antacid tablets. The product's dosage form is tablet, chewable and is administered via oral form. •each tablet contains: elemental calcium 300mg •store at room temperature. Keep the container tightly closed. Adipic acid, D&C Red No. 27, D&C Yellow 10, dextrose, FD&C Blue No. 1, FD&C Yellow No. 6, flavors, magnesium stearate, maltodextrin, , starch, sucralose.